My kids scratched their heads at this video because there’s a kid from the “Soviet Union.” Where was that again? It’s hard to believe not too long ago there WAS a Soviet Union and no such things as the internet or smart phones. The world has changed so much since “Captain Planet” was on TV but it’s message of protecting the earth and working together stay the same. Captain Planet and the Planeteers is getting a huge revival right now and I hear there is even a live-action movie in development. You can find out about the Planeteer Movement at http://captainplanet.me/ and on Facebook. The Power is Yours GIVEAWAY! 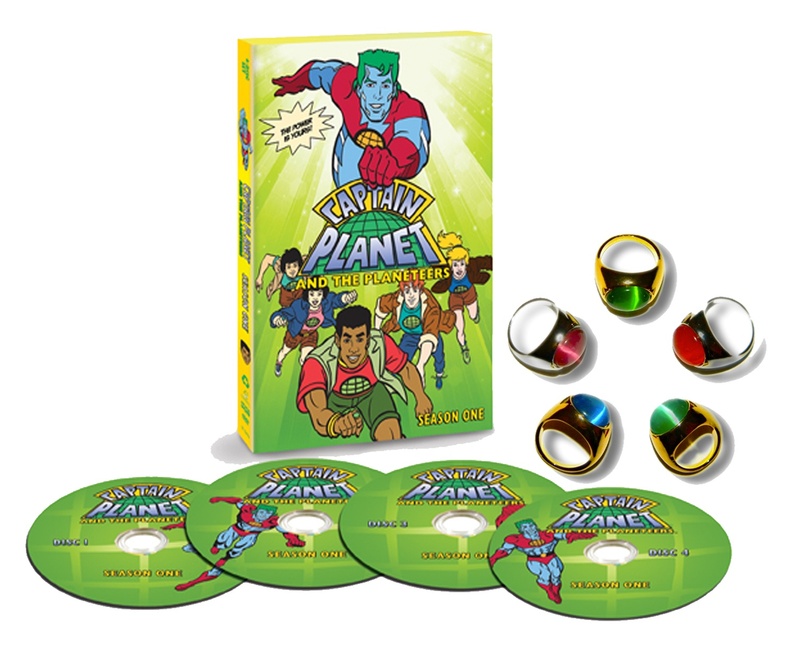 Share your thoughts on “Captain Planet” and how best to protect the environment and you could win these two great prizes: Captain Planet and the Planeteers Season One DVD signed by series co-creator Barbara Pyle and a limited edition Planeteer ring of your choice. * (The Power is Yours!) A winner will be chosen at random. Then on Sunday, February 19th, from 3:00–4:00 PST, join a Twitter party co-hosted by the Cap and Barbara as they celebrate Captain Planet reaching half a million fans on Facebook! Follow #Planeteers and you could win even more great prizes! *Size and color subject to availability. Next → Next post: Happy President’s Day! My son loves Captain Planet. We try to help the environment by recycling. Captain Planet is a true superhero! However, there are so many ways to protect the environment., and it’s important for people to realize that even small actions make a difference. Lowering your thermostat to save energy; turning off faucets to save water; recycling everything you can; buying in bulk to reduce packaging–it all adds up! The move towards being a superhero begins with baby steps! @rkosully I will be participating in the #Planeteers twitter party too! One of the most important factors to being green is to live sustainably. To live within your means. Some great ways of doing that is to only buy the food you are going to eat for the next few days. Or buy gently used clothes at a consignment shop. Or my favorite, freecycle! Being able to give someone a treasure you n longer need, for free, is a great gift. We need to learn where our products come from and to learn to use what we have already made. I was a Planeteer when the show’s fan club first started, but my parents were really the ones who helped me be aware of being eco-friendly. Captain Planet just added to it. I hope to be able to pass down that same awareness to *my* daughter when she’s old enough. Thanks for getting the word out! Captain Planet made me the environmental person I am today. I recycle and reuse everything. This is amazing, I used to watch captain planet as a kid and always put my rubbish in the bin or else he would be mad at me! Captain planet was a awsume show with diversity and a sense of humour to, I never realised how many ‘puns’ there were in this show 🙂 BRING BACK CAPTAIN PLANET AND SAVE OUR WORLD!!!!!!! I recycle as much as I can and have got my grandparents recycling as well and I’ve given up using plastic bags when I go to the store. I do the best that I can to encourage others to do the best they can as well. Not sure if this is how to enter the contest…? But…stop driving! (as much) Seriously! Walk, bike, it *does* make a difference. Have you heard about it snowing in Rome?! The Earth needs your help! I love Captain Planet! He was the first to teach me the best ways to protect the environment! Energy is everywhere. We use energy to move the mouse for a computer, to jump and shout and walk and run. It takes energy to power a light bulb, and the light that the bulb gives off is also a form of energy called radiant energy. Radiant energy from the sun enables vegetables, plants, trees and us to live and grow! Other forms of energy include heat, chemical energy, kinetic (motion) energy, gravitational energy and nuclear power. Captain Planet was my favorite show growing up. I really enjoyed the team spirit of the Planeteers, and to this day still believe that’s what it takes to save the Earth. If we would all just rally together, the world would be a better, prettier place for sure. You are so right Nicholas. Good luck and thanks for joining. Brent here from Nashville’s Planeteer Movement. I recently posted regarding artificial trees that help combat pollution. I know there are a quite a few trees such as the Red Woods and Giant Sequoia’s that really help filter the air. But these future technology suggestions aren’t half bad. Check it out for yourself on the Nashville Planeteer’s FB. Oi! And please God let me win th box set dvd’s!! I grew up with this show. Love and Kind Greetings to All around the Globe. That is very interesting indeed. Thanks for joining – good luck. Yes 🙂 The Captain Planet PR people should be sending your prize soon. Thanks!